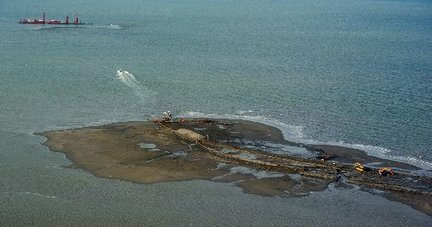 The federal government's latest effort to shut down Louisiana's effort to protect the coast is to halt sand berm dredging near the Chandeleur barrier islands. The feds are requesting that the dredging operation be moved two miles further offshore. The Chandeleur islands are an important nesting area for the brown pelican which has been hard hit in the oil crisis. Interior Secretary Tom Strickland says the current dredging operation compromises the islands in the event of a hurricane. He explains that the state was to install pipe that would transport sand from a less sensitive area, however, it would take five to seven days to run the pipeline, time which Plaquemines Parish President Billy Nungesser says could be better used to just build the berms. NOLA has the full story here. Jindal's argument is that it took so long to get the project approved in the first place, he doesn't want to stop and go through all the red tape again. Dredging is scheduled to stop at midnight Wednesday. It seems that the feds are doing everything they can to cripple Louisiana's own response to this crisis. Bobby Jindal reached his exasperation point long ago when he said, and I'm paraphrasing, If you're not going to fix it, get out of the way and let us do it ourselves! From the moratorium, and Salazar's promise to appeal the strike down of that moratorium, to the crazy red tape on the berm projects, to shutting down the skimmer barges for 24 hours, and now this? Well, we could get the idea that Team Obama was trying to neutralize Jindal's response, as if he were threatened by Bobby Jindal, or something. We have far too much government. Just wait till they use the same logic on your health care. Here's a question, Pam - if the feds qwere actively trying to stop us from cleaning up the oil, WHAT WOULD THEY DO DIFFERENTLY? Thanks for the linky love. I get angrier each and every day! We have known we needed barrier islands since 1925. C'mon Obama, Get Your Hands Dirty! 17 Afghan Military Pilots MISSING from Texas AFB? Sam Adams in Danger and It's All My Fault! This Oil Spill, It's Kind of Like 9/11, Ya Know? "When the Problems Go Away"
Jindal Says Obama Doesn't "Get it." SHOCK: Guantanamo Has Amenities for the Troops! How Do You Hide an Oil Spill? Not Resting. Nope. Not Resting. This is What Angry Looks Like? Is a Double Dip Recession on the Way?